Brazilians love football. Being no exception to the rule, I can spend hours discussing why it is one of the most beautiful and democratic sports on the planet. It would have to be, to move the hearts of over half of the World’s population. That being said, the World Cup organization in Brazil and Qatar have tarnished the beauty of the sport with a gruesome series of human rights violations. Recently Brazil was given a “yellow card” by Amnesty International due to its violent attempts to silence protesters. The massive demonstrations that took place a year before the start of the tournament showed the public discontent over the public expenditure on hyper-inflated budgets on infrastructure when the country’s education, health and social protection structures are deteriorating. Mega sporting events have the potential to bring investments, employment, economic growth and the improvement of urban and housing infrastructures, but they have been mostly known for forceful displacement and human rights violations. Hosting the game we love should be a joyful moment, but what we saw made the hope of the sixth title become overtaken by massive corruption, generalised greed, police brutality, sexual exploitation of minors, forced evictions,labour rights’ violations, and overall chaos in the hosting cities; this was coupled with the overall corruption and intimidation from FIFA, without mentioning the thousands of workers that have died during the construction of stadiums in Qatar. The new Brazilian stadiums cost millions. However, the ones in Manaus and Cuiabá are currently sad national jokes. There are exactly zero football teams in the area, leaving no one to maintain the stadiums. The government (which really means the taxpayers) paid millions for four matches. Worst of all, several workers actually died in their construction. To think that all the blood, sweat and tears went to waste for four matches is appalling and enraging. Since the tournament began, the World Cup has been a test for the “panis et circenses” method of entertaining crowds. The protests haven’t stopped, but they have been limited, mostly because they are being met with significant military force. The most important exception until now was the massive demonstration in São Paulo on June 19 to celebrate the first anniversary of the demonstrations, which I have mentioned in my previous post. 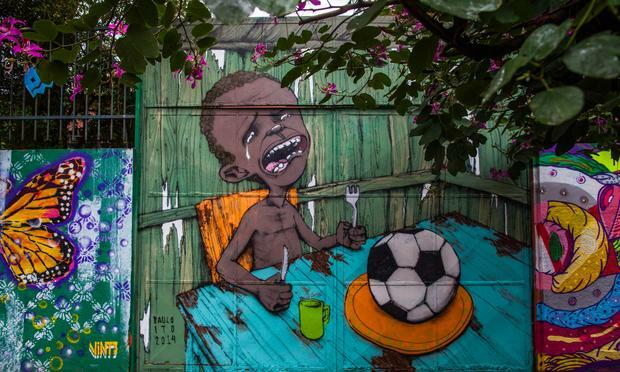 Now, when most of Brazilians think of the World Cup, they think of the hundreds of thousands that were expelled from their homes without notice to make cities prettier for the tourists. They think of the street kids that are “disappearing” from the streets of northeast Brazil. They think of themselves and their children who were threatened with extreme violence by law enforcement in case they decide to exert their constitutional right to protest against this corrupt and shameful administration of funds by the cities, states, the national government and, of course, FIFA. Presidential elections are in October of this year and many political analysts tie the results of the World Cup to the result of those elections. Once more, this will go beyond the sport. Once more, it will affect directly the lives of millions. As always, I’ll be rooting for Brazil. Natasha Leite has worked for the last 9 years with Governance and Security in Latin America, the Caribbean, Africa and Asia.